[By: David D. Burns M.D. / AVON / 1999] The good news is that anxiety, guilt, pessimism, procrastination, low self-esteem, and other “black holes” of depression can be cured without drugs. 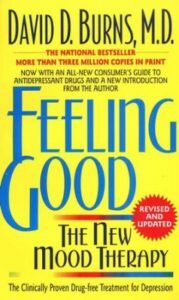 In Feeling Good, psychiatrist David D. Burns, M.D. outlines remarkable techniques that can lift your spirits and help you develop a positive outlook on life. Included in this updated edition is a consumer’s guide to antidepressant drugs as well as a new introduction to help answer your questions about the many options available today for treating depression.